A highly acclaimed, out of print biography of Scientology founder L. Ron Hubbard is back in print, and a Kindle version is also available. Written by British investigative journalist Russell Miller 1, Bare-faced Messiah: The True Story of L. Ron Hubbard — first published 26 years ago — is considered by many Scientology watchers to be best and most comprehensive biography of Hubbard. I am delighted that Bare-Faced Messiah is being re-published, particularly as the Church of Scientology continues to make ludicrous claims about the life and times of its founder. Indeed, Hubbard was a fantasist and charlatan who made up many stories about his life and accomplishments that, upon investigation, turned out not to be true. Yet throughout its history the Church of Scientology has not only failed to denounce and disavow Hubbard’s fantasies, but has itself greatly contributed to the body of fiction surrounding its founder. Searching for the PDF? You may have arrived at this page after clicking a link for the PDF version of Bare-Faced Messiah. This article explains why we have removed it in favor of a new print edition. The glorification of ‘Ron’, superman and saviour, required a cavalier disregard for facts: thus it is that every biography of Hubbard published by the church is interwoven with lies, half-truths and ludicrous embellishments. The wondrous irony of this deception is that the true story of L. Ron Hubbard is much more bizarre, much more improbable, than any of the lies. 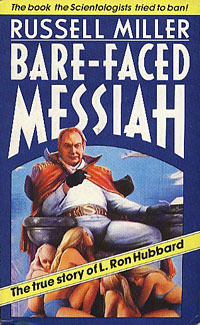 Bare-faced Messiah was first published in the UK in 1987, and later in Australia, Canada and the United States as well, despite legal challenges and a dirty tricks campaign by the Church of Scientology — which is known for its hate- and harassment tactics against defectors and other critics. Scientology observers point out that Miller quotes extensively from official documents, as well as from Hubbard’s personal papers, which were obtained from Scientology defector Gerry Armstrong. Original versions of Bare-faced Messiah have gone out of print years ago, but second-hand copies remain available — albeit at high prices. After the book went out of print an online version was created — and widely mirrored — with the express permission and cooperation of Russell Miller. Apologetics Index also hosted the book, in PDF format, but at the kind request of the new publisher we have now removed it in favor of the new edition. We believe this book, due to be published in February, 2014, deserves wide support from any and all Scientology watchers. This blog post was written by Anton Hein, founder and team member of Apologetics Index. Anton’s interests vary from Christian apologetics and interfaith dialogue to reading murder mysteries (and lots of other books). He enjoys street photography, quality coffee, cooking Mexican food (complete with home-made salsas), and working online. This entry was written after midnight, with the aid of a generous amount of Illy Coffee, a Bialetti espresso machine, and music from SublimeFM.